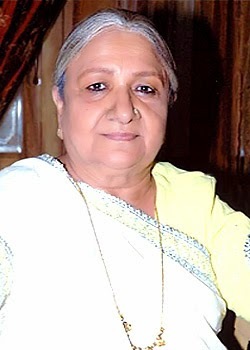 Sudha Shivpuri, better known as Baa of Ekta Kapoor's popular show 'Kyunki Saas Bhi Kabhi Bahu Thi' left for her heavenly abode today morning(20 May, 2015). The senior actress had suffered a stroke on Dec 2, 2013, which affected her basic motor skills. She stayed at the hospital for almost six months after the stroke. She was 77-year-old and had been keeping unwell for quite sometime and bid goodbye to everyone this morning. She will be cremated at Oshiwara Samshan Bhoomi at 2:30 p.m today. The talented actress started her Bollywood career in 1977 with Basu Chatterjee's 'Swami'. Later she was seen in films like Insaaf Ka Tarazu, Hamari Bahu Alka, Sawan Ko Aane Do, Sun Meri Laila, Burning Train, Vidhaata and Maya Memsaab. She was married to actor Om Shivpuri. Sudha started her TV career with serials like Aa Bail Mujhe Maar, Rajni, Missing, Rishtey, Sarhadein and Bandhan. Star Plus landmark show Kyunki Saas Bhi Kabhi Bahu Thi in 2000, marked the big break in her TV career. The actress is survived by daughter Ritu Shivpuri and a son. Scrutiny extends condolences to Sudha's near and dear ones.